Another beautiful plant on limestone is Campanula glomerata. 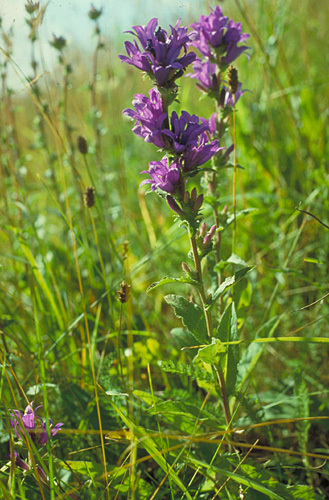 This species can be found occasionally through Denmark on chalky grassland all though it is getting rarer. Grassland on limestone is often very rich in species as can be seen in The limestone in Himmerland. As this type of vegetation is rare i Denmark, many of the plants to be found there are rare too. 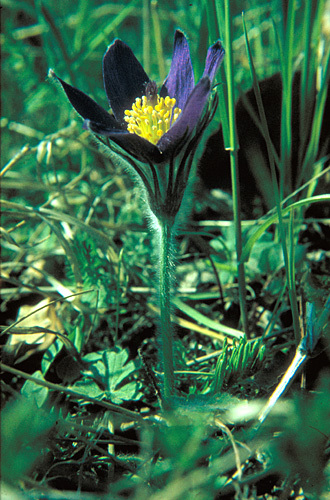 The beautiful Pulsatilla vulgaris in the left picture is common on many of the chalky grasslands in Jutland, but the species is very rare on the danish isles. Back to The limestone along the coast of Djursland.